The Greek philosopher Heraclitus said, “The only constant is change.” What he recognized 2,500 years ago—in an age without the smartphone—is exponentially more true today. Every time we turn around, there’s a new app, genius idea, or shiny piece of technology requiring us to check our assumptions about what’s possible. For those of us working in the marketing side of this brave new digital world, staying on the cutting edge can be the difference between success and irrelevancy. This notion of constant change has been personally hammered home lately as we work to rebrand SearchFest, SEMpdx’s annual digital marketing conference in Portland, Oregon. Through our discussions with members, attendees, and sponsors, as well as people outside our association, we found the term “search” was keeping some people away. To them, “search” has a very specific connotation that has little to do with everyday marketing efforts, even though they use search tactics daily as marketers. As I absorbed their feedback, I realized how much the idea of SEM has evolved over the last five years, and how many marketers have completely changed their approach to engaging the consumer. 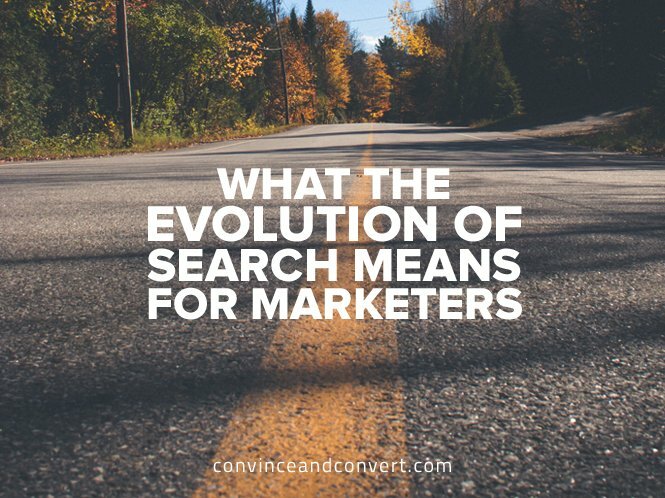 In our industry, the word “search” traditionally referred to marketers with a specific skill set working towards a specific goal, like SEO or SEM (AdWords). They used on-page SEO, keywords, and link building as tools to raise a website’s profile in a Google search. In addition, they may have created advertising campaigns to buy traffic directly. These techniques were often kept in their own silo, separate from other marketing efforts, and even each other. This is an understandable outcome of our limited knowledge of the technical side of SEO during the early years of the search engine. But as marketers and consumers become more savvy, the stand-alone approach to search no longer produces the best results. One can’t simply send a bunch of traffic to a site and expect success. Evolve or die, right? Many companies have had great success “just” doing search, but times have changed—in part, because Google is rewarding more holistic approaches to marketing, as well as penalizing old SEO “techniques.” Companies also have much faster access to information and more in-house knowledge. Spending large amounts of money to drive traffic through PPC or high rankings just doesn’t cut it anymore. Clients know better questions to ask and are demanding more from their marketing partners. Consumers’ expectations have also changed dramatically. They demand better, more immersive and social experiences with almost unlimited access to information about brands, products, and services and other people’s opinions and experiences with those brands, products, and services. Good marketers understand that they have to engage with their target markets to have success. More and more, marketers are changing their mindset to think about the user’s experience beyond the initial click. For example, when Superior Glove came to WebRanking for SEO and PPC help to increase user engagement and web conversions, WebRanking was able to guide them to expand their organic and paid search initiatives to focus on the larger ecosystem of customer engagement. By leveraging user experience testing, personas, and journey mapping, WebRanking could start creating comprehensive content plans that could facilitate the production of the kind of authoritative content Superior Glove would need to influence their most important decision makers online. To amplify this new, improved content, they added a more robust paid effort that employed targeted remarking and conversion rate optimization (CRO) as well as social media to generate and nurture relationships with key influencers within targeted demographics. The result was a dramatic increase in traffic for Superior Glove. So how do other savvy marketers operate in this new world of search? Has the SEO and SEM culture completely come to an end? Absolutely not. Where Does Search Fit Today? “Search” needs to live with the development team. But before that, it needs to live with the UI and UX teams. Content marketers, copywriters, and PR are a crucial part of the process too, as they must develop the right content and distribute it to the correct places. Reinforcing all these efforts with a robust search strategy makes the real difference. The best success happens when inbound and outbound teams work together by boosting the earned or owned media with ad spend—creating and supplementing demand with engaging content and digital experiences, similar to Webfor’s work with WeightWise to improve their seminar sign ups. Webfor used UI, UX, and strategic content planning to build WeightWise a new, mobile-friendly site that was technically sound, adhered to SEO best practices, and was conversion-optimized for the increased traffic being sent to it from paid search, paid social, and remarketing campaigns. Not only did this engagement-focused approach result in record high seminar sign-ups for WeightWise, it dramatically increased web conversions. On the SEM/PPC side, many organizations have the same people managing AdWords as well as Facebook and Twitter ads. This approach requires a strong culture of communication and flat departmental structures, but when all those factors are in place, the results speak for themselves. Search lives everywhere, and it’s not just search anymore. It’s not often that we can go anywhere in a straight line, and that is true for our experiences with brands. Yes, we are all searching for something, but that something may be an engagement or prize that we can’t put in a box. Amid all this change, we ponder the future of SearchFest. The more we thought about the direction of our industry, and the more we talked with our colleagues, we came to understand that engagement is what unites us now. With that in mind, our new conference—slated for March 9, 2017 with tickets available now—will be called Engage. It will bring the best search professionals, content marketers, digital strategists, social media experts, creatives, and thought leaders together under one roof to learn new techniques and share their experiences. As our industry continues to change, it’s vital that all of us change together. Mike Rosenberg is CEO of Veracity, a boutique marketing agency based in Portland, Oregon. A longtime board member and immediate Past President of the nonprofit trade association SEMpdx, Rosenberg lead the rebrand of the association’s signature event to Engage (formerly called SearchFest). Kevin Getch of Webfor and Tony Svoboda of WebRanking (both Board Members of SEMpdx) contributed to this article.